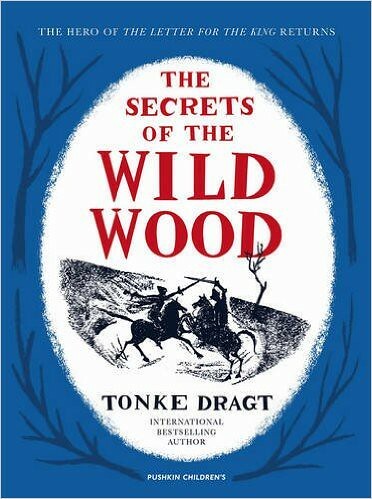 The Secrets of the Wild Wood by Tonke Dragt is the sequel to her prize-winning story, The Letter for the King. Originally published in Dutch as De geheimen van het Wilde Woud, it is now, for the first time, available in an English translation by Laura Watkinson, published by Pushkin Children’s. The story carries on from the end of The Letter for the King. Tiuri, now Sir Tiuri, has returned from Unauwen and is waiting with his squire, Piak, for the return of the knight-errant, Sir Ristridin, who was last heard of leading a small band of knights into the mysterious Wild Wood in pursuit of the secrets it contained. That was autumn. It is now spring, and nothing has been heard of Ristridin for many months. Rumours abound. Risitridin has sworn to punish the Black Knight with the Red Shield for the murder of his friend Edwinem. Has Ristridin himself been killed? Has he ridden to Deltaland? If so, why did he not first come to Castle Ristridin? Tiuri and Piak decide to seek news of Ristridin at Castle Islan on the very fringes of the Wild Wood. ‘There won’t be anything of interest happening there,’ says Sir Bendu. He couldn’t be more wrong. Tiuri and Piak are embarking on an adventure which will see Tiuri captured and Piak battling to free him. Who are the Men in Green and what is the secret of the Unholy Hills? On the way to solving these questions Tiuri and Piak meet the beguiling Isadoro and encounter two old friends from the first book, Lavinia, daughter of the Lord of Mistrinaut, who still preserves her romantic feelings towards Tiuri and Marcus, the Fool in the Forest. And Tiuri plays a fateful game of chess against the Black Knight himself. I especially enjoyed the book’s description of the natural world. Dragt (or is it the translator?) seems to have a knack for conveying the interplay of the seasons, weather, the countryside and man. I found myself, especially in the early chapters, reminded of the winter landscapes of Breugel. The language feels very natural and straightforward. There is none of the affectation in dialogue which sometimes accompanies history or fantasy. I was intrigued to discover that Dragt only read The Lord of the Rings after she had written The Letter for the King. Apparently, she was afraid to write anything for six month afterwards for fear of being influenced by Tolkien. 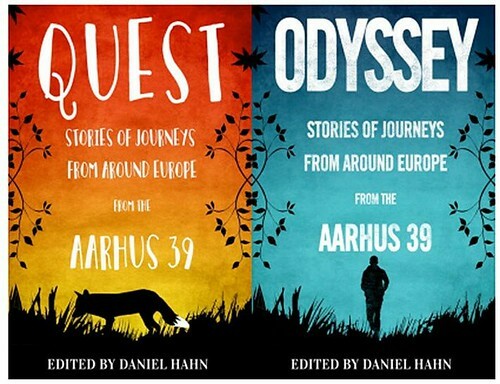 There’s an obvious Arthurian influence but, on the whole, I think the fantasy in the two books benefits from Dragt not having had the opportunity to study Beowulf. I thoroughly recommend this book. The Letter for the King is recognised as the best children’s book ever in Dutch. I believe The Secrets of the Wild Wood is just as good. It’s just a pity that we’ve had to wait fifty years to be able to read it in English. 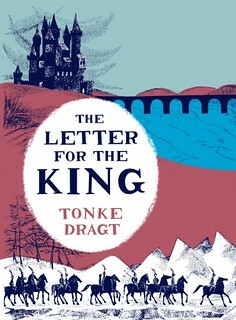 ‘Looking for something escapist to read, I came across Tonke Dragt’s The Letter for the King (Pushkin Press). The publisher, and the author’s name, led me to suspect that this must be a translation. And I was right. Tonke Dragt was born in Dutch Indonesia in 1930, spent several years in a Japanese prison camp and came to the Netherlands with her family at the end of WWII. The Letter for the King was her second book, published in 1962. It was very successful in the Netherlands where it sold over a million copies and was chosen, in 2004, as the best Dutch children’s book of the last fifty years. It has been widely translated but only made it into English in 2013. Ever since Swallows and Amazons and Treasure Island I have been captivated by books which contain maps. I even drew my own map for Kidnapped, and when I showed it, aged 12, to my English teacher he lent me his personal copy of The Lord of the Rings. But that’s another story. 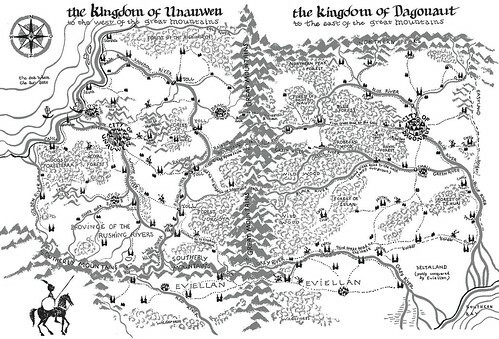 The Letter for the King starts with a map of the Kingdoms of Dagonaut and Unauwen. I assume it is the author’s as she is credited for the illustrations, and was an art teacher. I found myself referring the to map quite often as I read the book. It’s basically an adventure story set in a fantasy medieval world which owes a greater debt to Le Morte d’Arthur than to Tolkien. Tiuri, the sixteen-year-old hero, finds himself suddenly tasked with the challenge of secretly delivering a letter across half a continent. The story follows his development as he deals with the difficulties along the way and tries to decide who he can trust. He learns that first impressions can sometimes be misleading, that help can come from unexpected directions and that hindrance sometimes arises from misunderstanding. The fantasy is relatively realistic. There are no mythical creatures and there is no magic. Putting geography, and history, aside it feels more like historical fiction than fantasy. Though I think the characters take baths more often than would have been the case in any medieval period! One strength is the clarity of the language for which, presumably, the translator, Laura Watkinson must take credit. I found it easy and enjoyable to read and it doesn’t feel dated in the way that English books published fifty years ago often do.